It is still cold, and to add insult to injury, it is snowing. After I made six pounds of buffalo pot roast this morning to fill my freezer (and heat my kitchen), I decided to make more soup – the overall cure for cold and snowy weather. I had canned pumpkin left over from an earlier project, so that became the basis of my recipe search. This soup was a reader contribution to American Profile (another of those magazines that gets tucked into print newspapers). Although the ingredients seemed a bit odd together, I did have them all in the house, and it was quick to make. I minced my onion and celery in the food processor, which gave them a nice texture in the soup. Also, since I had already used the processor, I just reused it to puree the stewed tomatoes. The soup is quite thick and has some texture. 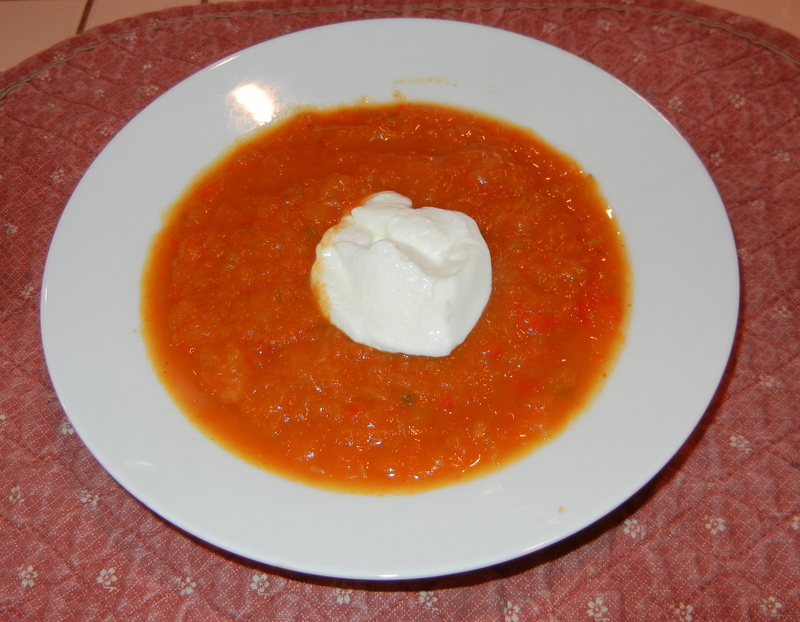 It was really good with a dollop or two of non-fat sour cream in it (Everything is good with a dollop of sour cream!). I ate it for dinner tonight, packed one container to take for lunch this week, and the rest are carefully packed and labeled in the freezer for other cold days which, no doubt, are yet to come. Melt the butter in a Dutch oven or heavy skillet over medium heat (I used my ever-present big wok). Add the onions and celery. 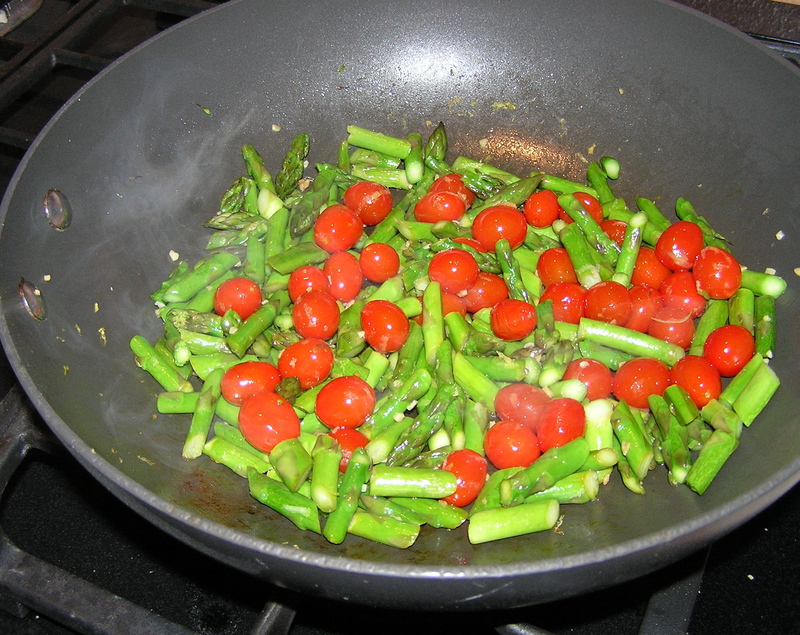 Cook for about 10 minutes, until the vegetables are softened (and your kitchen smells warms and delicious.) Sprinkle the dried ginger on top, and sauté for 30 seconds. Add the broth, and bring to a low boil, stirring occasionally. Meanwhile, purée the canned tomatoes (with the juice) in a blender or food processor. Stir the tomatoes and the pumpkin into the broth mixture, and simmer covered for about 20 minutes. If the soup is too thick, add more broth or a little water. 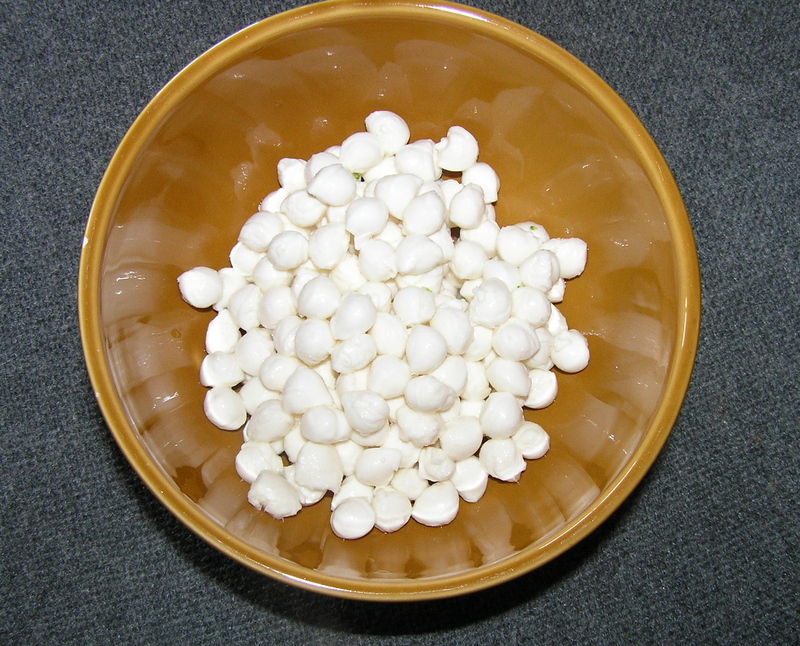 Season with pepper, and garnish with sour cream. Makes 6 servings at about 3.5 grams of fat/serving. The tomatoes are still coming on strong, but the nip in the air once the sun goes down tells me that it’s soup making weather. I still have a lot of produce coming out of the garden, although the plants themselves are starting to look rather tired. 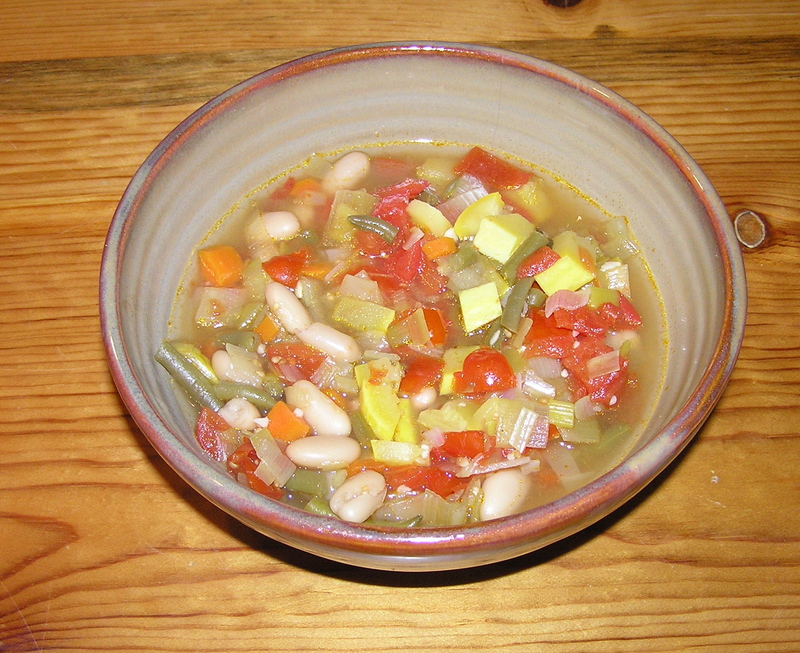 Minestrone means “big soup”. 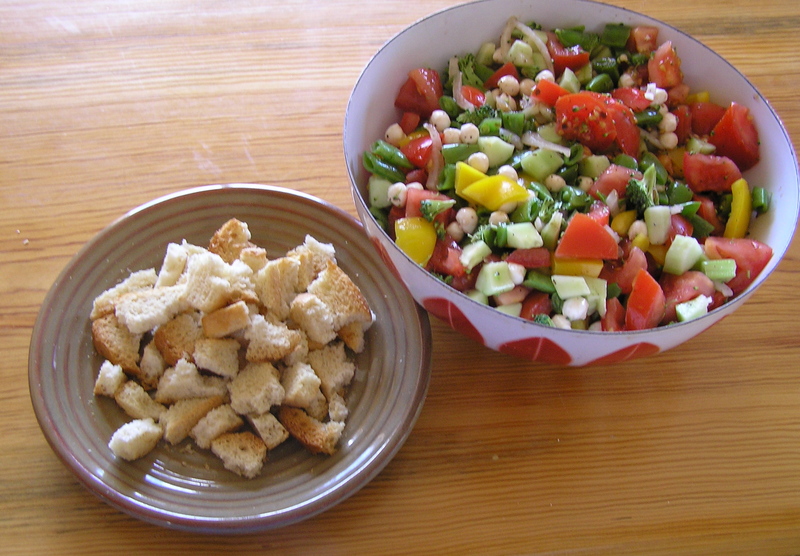 It is one of the cornerstones of Italian cuisine, and no doubt thrifty Italian housewives did as I did – used whatever vegetables were in season. Minestrone ranges from thick and dense to a more broth-like soup with large quantities of diced and lightly cooked vegetables. It typically has beans in it, and sometimes includes meat or pasta. This soup used up all the little roma tomatoes, although I expect when I go out tomorrow morning there will be more of them. This is not a heavy soup. It is more on the broth with vegetables side. You could easily add some pieces of chicken to the soup, or some pasta or sprinkle on a couple of tablespoons of parmesan cheese, as long as you accounted for the fat grams. I have been sprinkling 2 tablespoons of grated parmesan over the soup when I eat it – for an additional 4 grams of fat/serving. In a large pot over medium-low heat, heat the oil. Tie herbs and parsley in a bundle with kitchen string if desired (this makes it easier to fish out later). 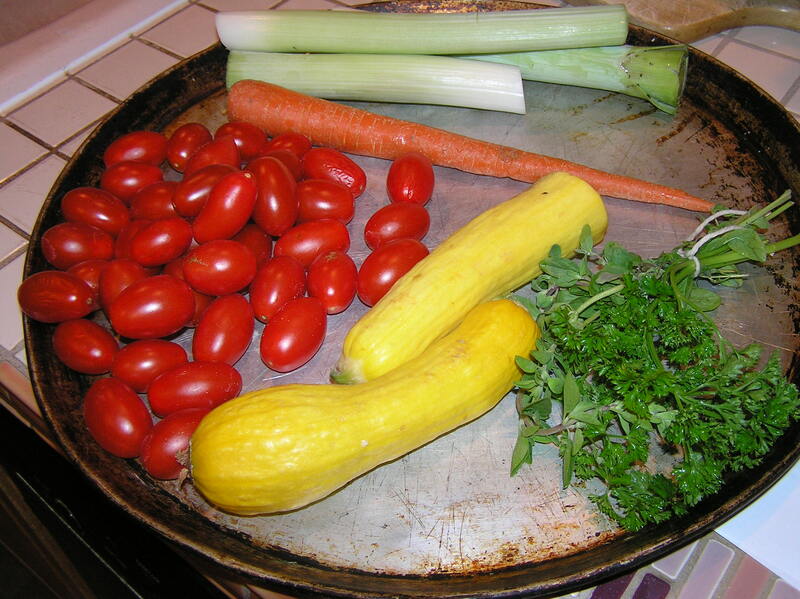 Add the herbs, leeks, garlic, zucchini or yellow squash, carrot, salt and pepper to the pot and sauté until the vegetables are golden, 10 to 15 minutes stirring occasionally. Add broth, beans, tomatoes, green beans and 4 cups water to the pot. Simmer partly covered 45-60 minutes. Discard herbs. Thin with a little water if the soup is too thick. Makes 6 servings at 3 grams of fat/serving. I’ve got nice big round ones, little long romas, yellow, red, and orange bite size ones. This is the first year I’ve actually been able to grow tomatoes – or any vegetable as a matter of fact. The deer always ate the bushes. This year, though, I deer-fenced the back yard. And although the deer gaze longingly at the raised beds, they can’t jump an 8 foot fence. When the tomatoes first started getting ripe, I ate them right off the bush as fast as I picked them. They never made it to the house. But then they really went crazy. I’ve got tomatoes everywhere. I sliced them up for dinner every day. I took them for lunch mixed with the only two banana peppers from my garden that actually got ripe and a bit of crumbled goat cheese. But now I need to get serious and start cooking with them. I decided to use this as a reason to make a quiche with a potato crust. Last summer I visited a friend and they served 2 quiches that had potato crusts. 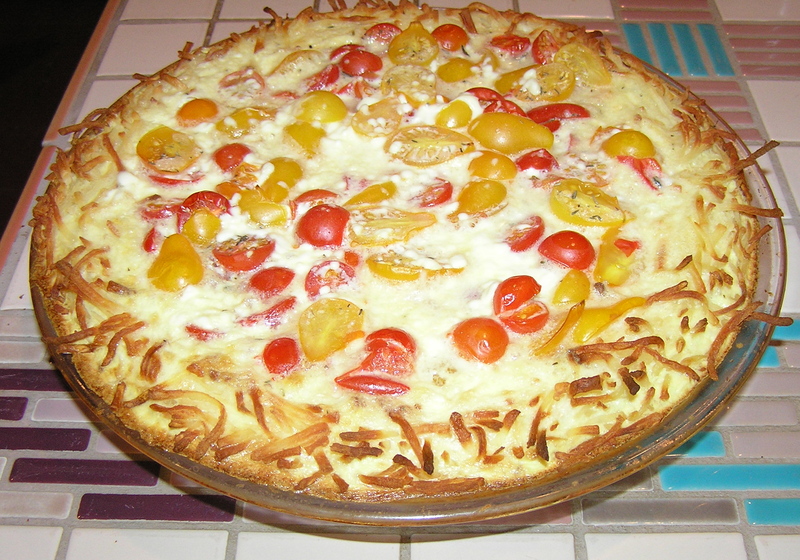 This eliminates the high fat part of the quiche – the crust – and it was delicious. They recommended using the dried hash browns from Costco that come in a big box. You just follow the instructions to reconstitute them, and once they are reconstituted, use them like regular potatoes. But here is a major WARNING. 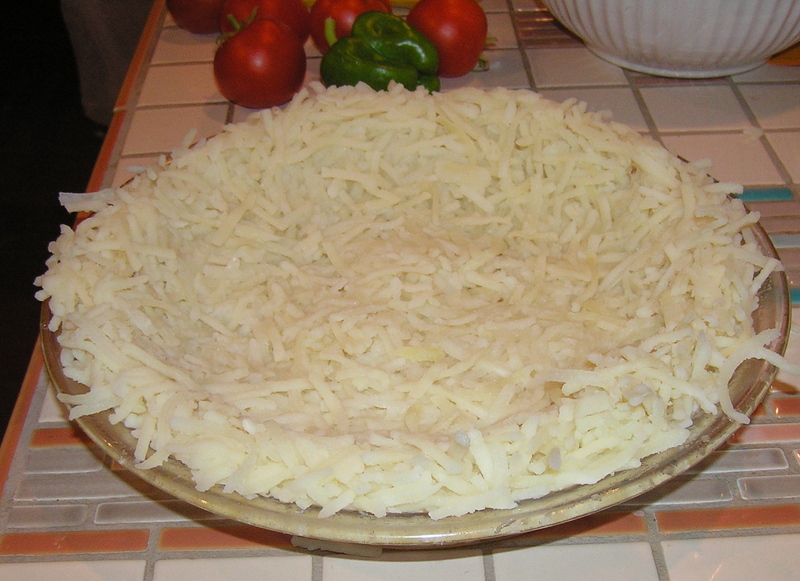 The first time I made the crust, the notes I had from my friend said 3½ cups of grated potato. So I scooped out 3½ cups of the dried potatoes and reconstituted them. Only they made a lot more potatoes than I expected, and my first crust was way too thick. So what the recipe really means is 3½ cups of grated potatoes – after reconstituting, which really is about 2 cups dry. Bake 25 to 30 minutes until the potatoes are golden brown. Remove from oven and cool slightly. Reduce heat to 350. Spread halved tomatoes over baked crust. Sprinkle with thyme. Beat together goat cheese, egg substitute and milk until thoroughly blended. Pour over tomatoes. Bake for 30-40 minutes, until filling is set. Makes 6 servings at about 3.5 grams of fat/serving. 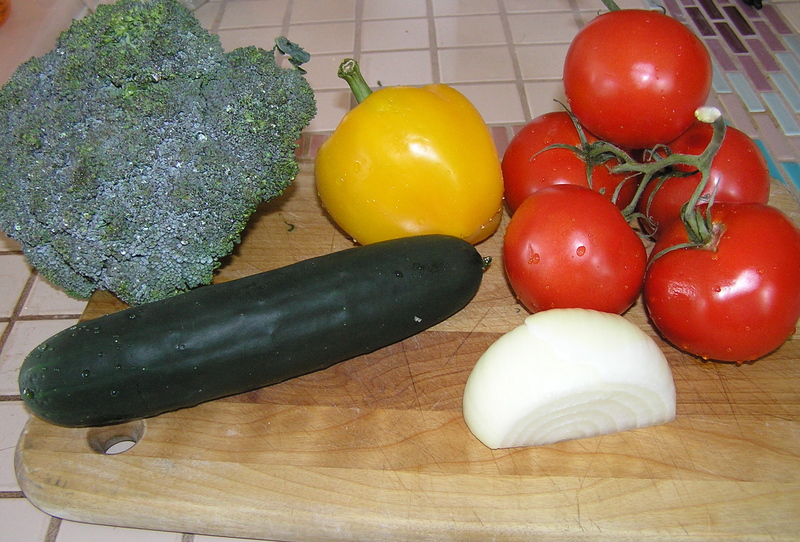 Now sing a few bars: home grown tomatoes, home grown tomatoes…. I must confess that some of my culinary expeditions are based on the fact that I have aging groceries, especially produce, that has to be used. The luscious chicken and grapes was invented to use up a sack of rapidly aging grapes, and I have posted bananas recipes until I couldn’t stand to look at bananas due to an over purchase. My usual problem is that I see an item I like on sale, and buy too much, expecting that I will have time or appetite to use them before they get iffy. This was the case with a container of organic cherry tomatoes that I thought I would nibble on as a snack…but instead found them wrinkling on the back of the kitchen counter. You know of course, that you’re not supposed to refrigerate tomatoes or they lose their full flavor, but this does make them prone to the need to be used in a reasonable amount of time. This recipe was part of a larger recipe that had something to do with chicken, but I was only interested in the tomatoes. 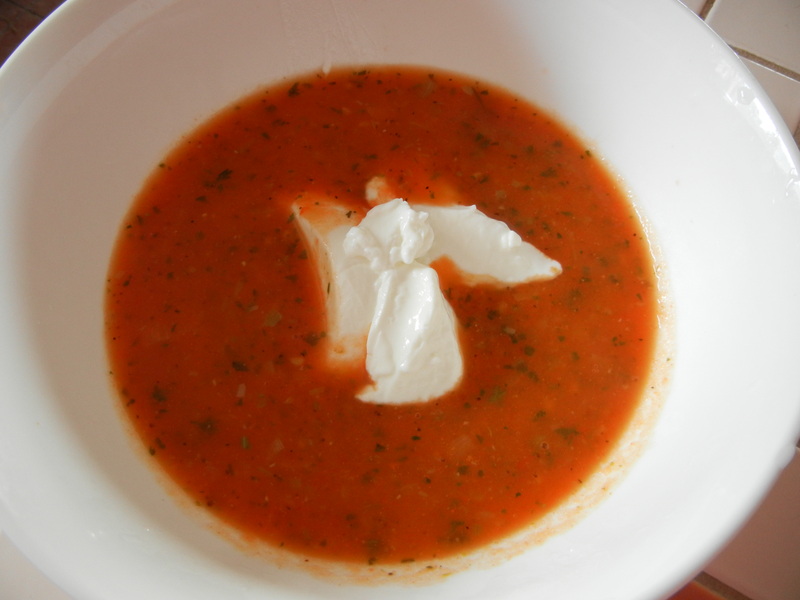 After tossing out the few tomatoes that had gone beyond iffy, I proceeded with this very easy recipe. Preheat oven to 425. 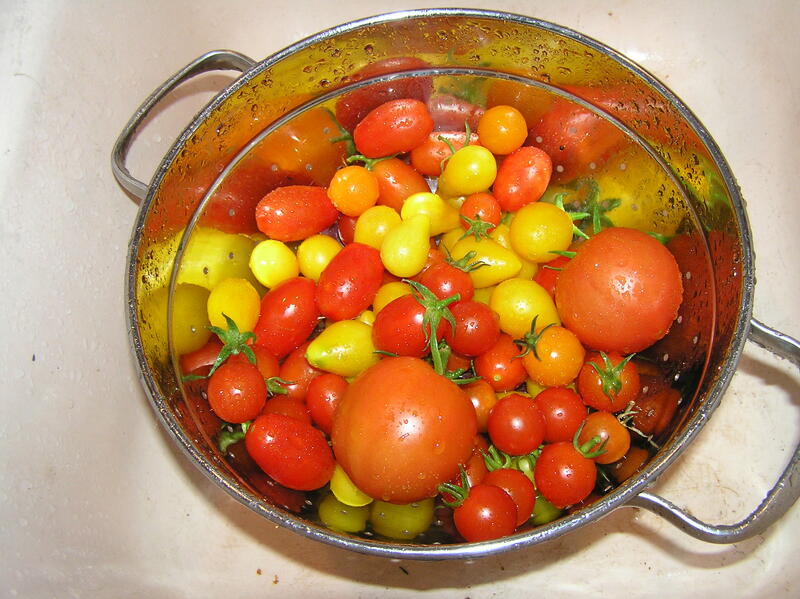 Combine tomatoes and 2 teaspoons of oil in an 8 inch square baking dish and toss gently. 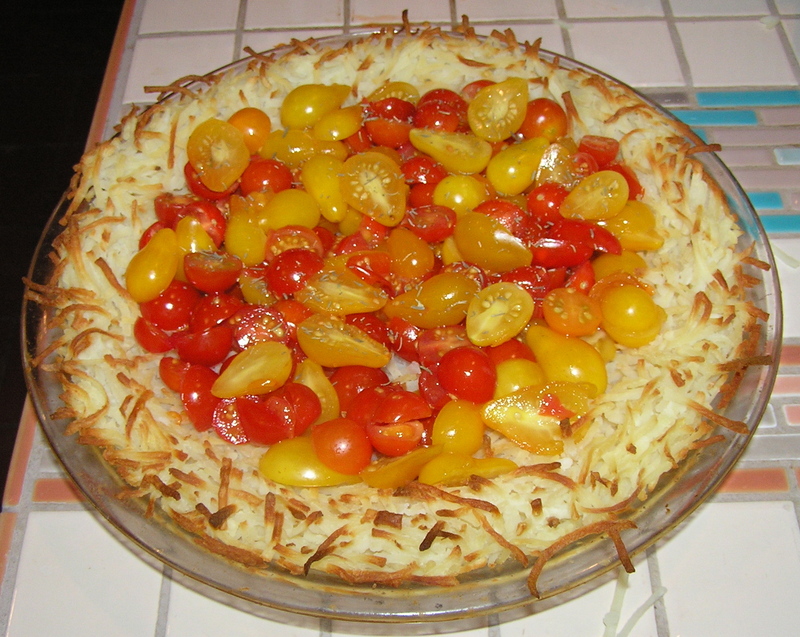 Bake at 425 for 18 minutes or until tomatoes are tender. 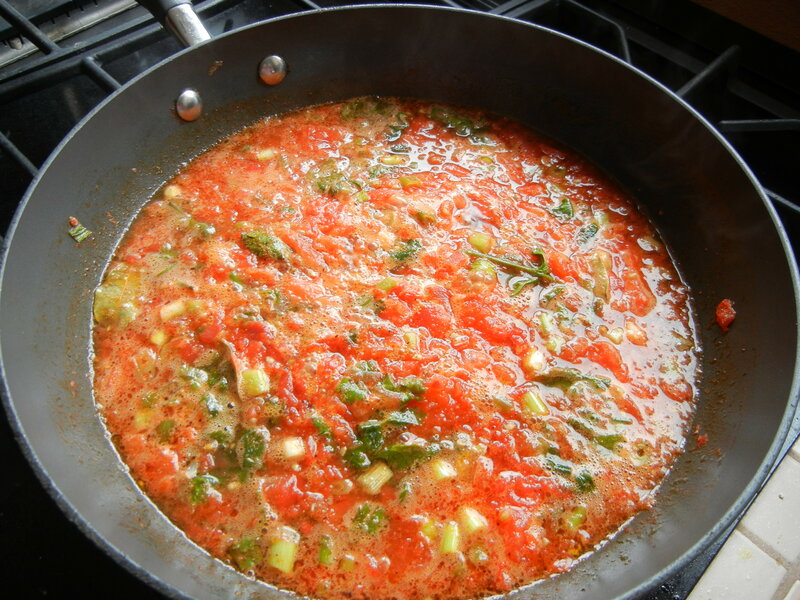 Combine tomato mixture, parsley, and remaining ingredients and stir gently. Makes 4 servings at 2.5 grams of fat/serving. Serve hot, cold, or at room temperature. Variation: add 1 ounce of reduced fat blue cheese and 1 gram of fat/serving. 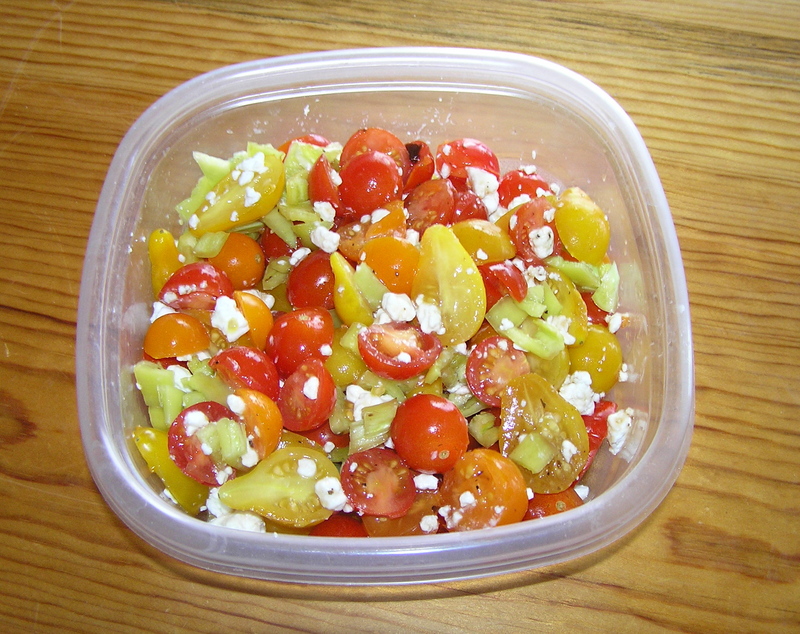 l ate the roasted tomatoes hot as a side with a small buffalo steak, cold alongside tuna salad for lunch, and one day I added blue cheese to the cold tomato mix. I think this would also be very good over grilled fish, and I plan to make it again when the snow goes away and grilling season begins. Yes, you guessed it, 5-9 inches of snow expected tomorrow. Does snow blowing firm the abs?